Crapaudine beets. Photo borrowed from Bakers Seeds, perhaps the only place that sells the seeds. I’ve got no time for quick things! But really, no major changes this week. The wonder of summer continues. I am running behind on everything this evening. Everything. Sorry if you come to the market first thing Thursday morning and things are a little chaotic. It’s my fault. One of the things I’m running behind on is examining and cooking the heirloom beets we received this week. 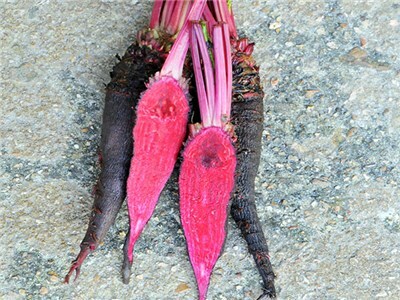 They’re the crapaudine variety, reportedly the oldest known variety of beets, and renowned for their flavor. I’d never heard of them, and so requested them based on those two pieces of information. I can’t wait to try them. And for me, I’m running downstairs to receive the Village Acres delivery!